Les Slavin runs a successful stall on Tenbury Wells market selling a variety of grocery items, cake, biscuits and confectionary. His stall is open 3 days per week Tuesday, Friday and Saturday between 8am and 3 pm. Les started trading in 1979, when he ran multiple market stalls including one in Bromsgrove that he purchased from our own Barrie Lewis. He is one of our long standing customers having dealt with both Barrie and Paul over the years. Les has seen many changes over his years working the markets (as he says, he started when Julius Ceaser was a boy!). "Before the days of increased competition from Supermarkets and Car Boots the market was where people went to find a bargain" said Les, "whilst there's still a demand it's not what it used to be and it's harder to offer customers the variety I'd like to". 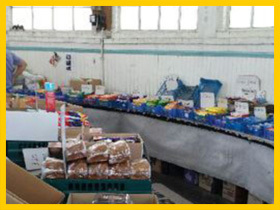 Which is why Les buys from us, "there's no where like here" he said, "you stock a bit of everything". We share Les's plight, we've seen a change in our customer base and the range of products we can buy as competition from discount retailers and supermarkets has increased over the years. We always endeavour to do our best to offer our customers a good variety of products at a competitive price and strive to make their buying process as enjoyable as we can. 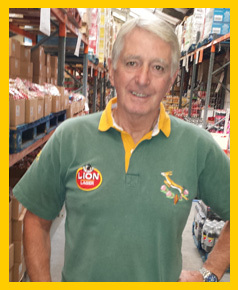 Les buys from us because we offer him variety and he told us, "it's always a pleasure to come to Lewis's, I've always found it to have a friendly, family atmosphere, everyone is very helpful".